Along with the three gold statues Macklemore & Ryan Lewis already took home before the ceremony, they've just nabbed Best New Artist. If any act is big enough to break the Best New Artist curse, it's these guys. The 2014 Grammys' Best New Artist category consisted of a total mixed-bag of genres. It also was a total boy's club (ugh). Country star Kacey Musgraves was the lone gal amongst fellow nominees James Blake, Kendrick Lamar, Macklemore & Ryan Lewis, and Ed Sheeran (precious!). Acoustic and hip-hop and electronic, oh my! Oh yeah, and Lorde was totally shut out this year. UGH, 2013 AND YOUR MUSIC. This year's frontrunner for the award was most certainly Macklemore & Ryan Lewis, the fur-clad showmen who made mainstream hip-hop that was as fun as it was thoughtful (though questionable at times).The ceiling just couldn't hold them, and they wanted you to know it. (Sorry Lorde, I know you're tired of songs where people tell you to throw your hands in the air, you still rule). So it comes as no surprise that these guys are the big winners. 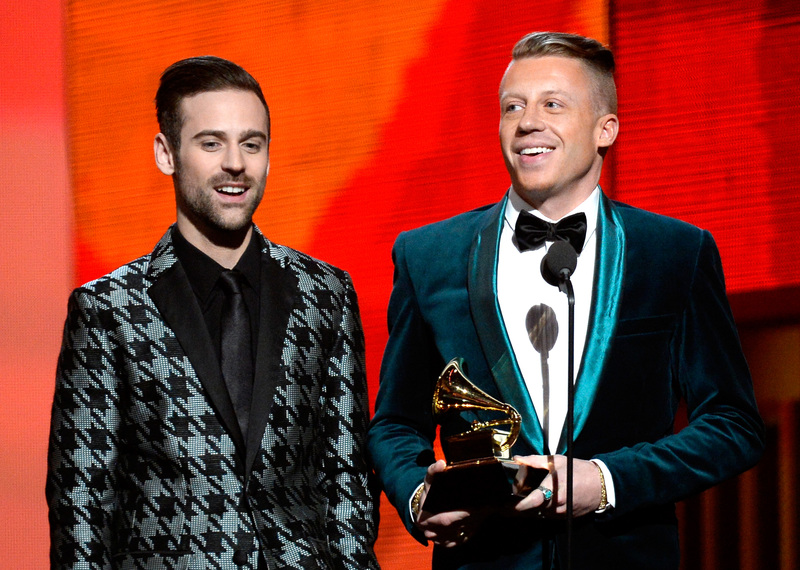 Macklemore dedicated the award to his fans in a big big way along with his fiance, family, and production crew. It was hilariously fitting that Macklemore was cut off while saying, "We made this album without a label." What are you trying to say there, hmmmm INDUSTRY?